WITHOUT starters Jeremy Lin and Amare Stoudemire, the New York Knicks didn't seem to have enough firepower to prevail in a showdown against one of the beasts in their conference Wednesday night at the Madison Square Garden. But perception is not always reality. And the Knicks proved that adage true once again when they routed the visiting Orlando Magic, 108-86, to keep a stanglehold of the 8th and last playoffs berth in the NBA's tight Eastern Conference postseason race. The Knicks moved up to 26-25 in the East standings, shoving them 2 1/2 games ahead of the 23-27 Milwaukee Bucks, who are lurking closely at 9th place. The 18-32 Detroit Pistons are distant longshots at 10th place. 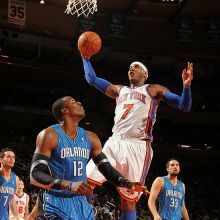 Carmelo Anthony and rookie Iman Shumpert led New York's relentless assault with 25 points apiece. The small forward-shooting guard combo drilled a combined 19 of 36 field goals including 6 of 15 beyond the arc. They also had 12 rebounds and 10 assists between them. Orlando was in cruise control early, taking a 24-16 edge before ending the first quarter with a 29-25 lead. But it went downhill from there for Orlando as the Knicks outscored the Magic 32-12 in the second quarter. And no thanks to a 21-0 run, matters turned exponentially worse as the blazing-hot Knicks built a 39-point lead following a Shumpert jumper that made the count 88-49 with still 2:58 left in the third period. The third period ended at 90-51 and both teams played the final 12 minutes only because it was required. Jameer Nelson led the Magic with 17 points and 4 assists while J.J. Redick pumped 15 off the bench. But man-mountain Dwight Howard didn't dominate the middle as expected. The Magic center had a so-so 12 points and 5 rebounds in 28 minutes of play. The Magic shot just 32-of-69 field goals (44.9 percent), 9-of-26 threes (34.6 percent) and a pathetic 15-of-26 (57.7 percent) from the free throw line. The Knicks, meanwhile, 43-of-85 field goals (50.6 percent), 12-of-34 threes (35.3 percent) and 10-of 12 free throws (83.3 percent). Besides outrebounding the the Magic 49-34, the Knicks also won the asssits battle, 24-14, and committed fewer turnovers, 11 to 18. But everything isn't so rosy for the Knicks moving forward as they will miss Stoudemire for two to four weeks with a bulging disk on his lower back that will require non-surgical treatment and rehabilitation. Lin is only day-to-day with a knee injury.